January 4, 2019 January 3, 2019 / Elizabeth T.
It’s officially 2019! I can’t believe 2018 is already over, and it’s officially January! It’s definitely been a whirlwind of a year, but I’m determined to make 2019 a good one! Before I get ahead of myself though, it’s time for my first official post of the new year, and there’s nothing more appropriate than a round-up of my favorites from December 2018! So without further ado, let’s get started! I know I’m pretty late to the game, but I just recently purchased a PMD Personal Microderm Device, and I’ve been loving it! 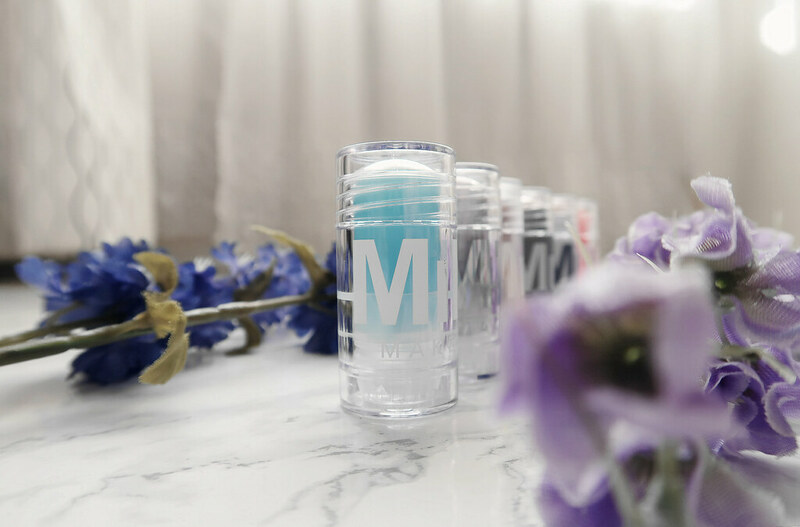 If you don’t already know what a PMD Personal Microderm Device is, it’s a patented, safe, and effective at-home skincare tool that is supposed to mimic professional microdermabrasion treatments. With its revolutionary patented spinning disc technology and calibrated vacuum suction, the device helps to exfoliate the skin for brighter, smoother, and more even skin tone and texture. It also helps to reduce the appearance of fine lines and wrinkles, blemishes, and enlarged pores. At first, I was a little hesitant to try it, since I have pretty sensitive skin, and I was scared this device might be too abrasive for me, but after hearing a lot of great reviews, I decided to invest in one, especially since Sephora had a sale last month! To be quite honest, my skin does feel tight and slightly uncomfortable when I use it, since the exfoliation action removes dead skin cells barrier, but after the initial redness, my skin looks instantly smoother. The best part is that it helps skincare penetrate deeper and also promotes natural cell growth to reveal younger-looking and rejuvenated skin! After using this and applying my usual skincare, I wake up with glowing skin in the mornings! Professional microdermabrasion treatments in offices are quite costly, but with the personal device at home, I can achieve similar results. The device may be on the pricier side, but in comparison to the professional treatments, this is definitely worth the investment. As many of you know, my hair has been colored for about nine months now, and though I got a relatively low maintenance balayage highlight treatment, my hair does require a bit more care than it did before. Since I had some of my hair bleached prior to coloring, I’ve been investing in a variety of shampoos and conditioners that help lengthen the lifespan of the color in my hair. My favorite thus far, though, has been none other than this one from Amika! I typically use relatively lower end one at home, but over the past few weeks, since I was traveling, I picked up a travel-sized version of purple shampoo at my local Sephora, and I’ve been loving it ever since. Made with wild cherry bark extract and avocado oil, this purple shampoo smooths and softens the hair while eliminating hair-dulling hard water build-up. 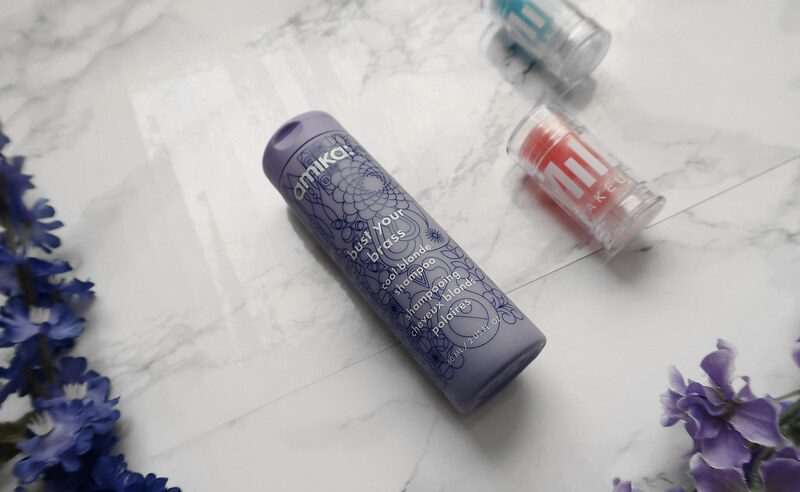 Another big plus – this formula from Amika is vegetarian-friendly, cruelty-free, sulfate-free, and phthalate-free! After a couple of uses, I’ve noticed that my hair is significantly less brassy, and it’s even turned some of my more “yellow” highlights a nice silvery color! I’ve even gotten compliments from some of friends because they thought I was trying a new color, but they were all amazed that it was really just my purple shampoo! If I had to pick one single thing that I loved about the holiday shopping, it’s none other than all of the pretty makeup and skincare gift sets that are available at literally every department store! This Christmas, I gifted myself the Milk Makeup set, since I’ve heard such great things about their products! 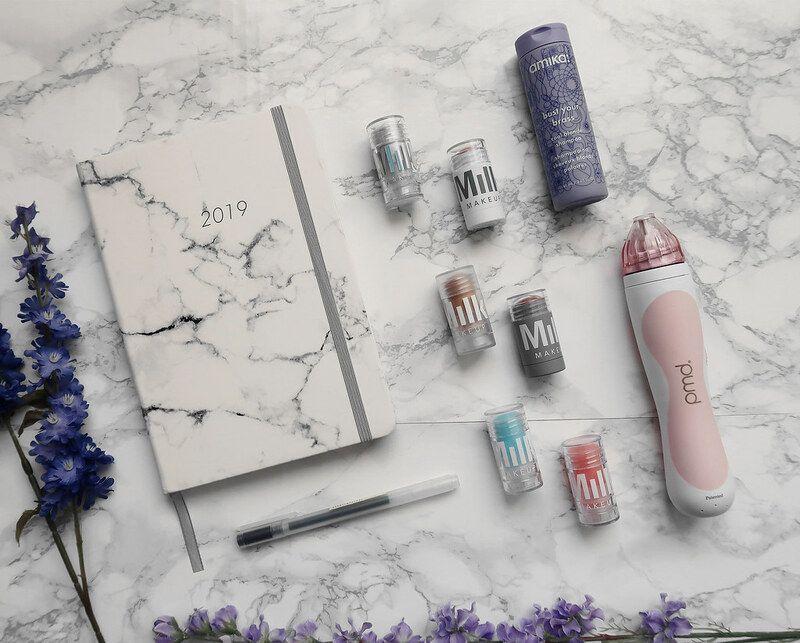 The set includes some of their best-selling makeup and skincare sticks, including the KUSH Mascara, Cooling Water Under-Eye De-Puffer Stick, Watermelon Brightening Serum, Blur Stick Matte Primer, Lip + Cheek, and Highlighter. I’ve been loving all of the products, but my absolute favorite is definitely the Lip + Cheek stick, since it’s gives off such a natural, sheer tint that’s perfect for the makeup looks I usually wear on a daily basis. 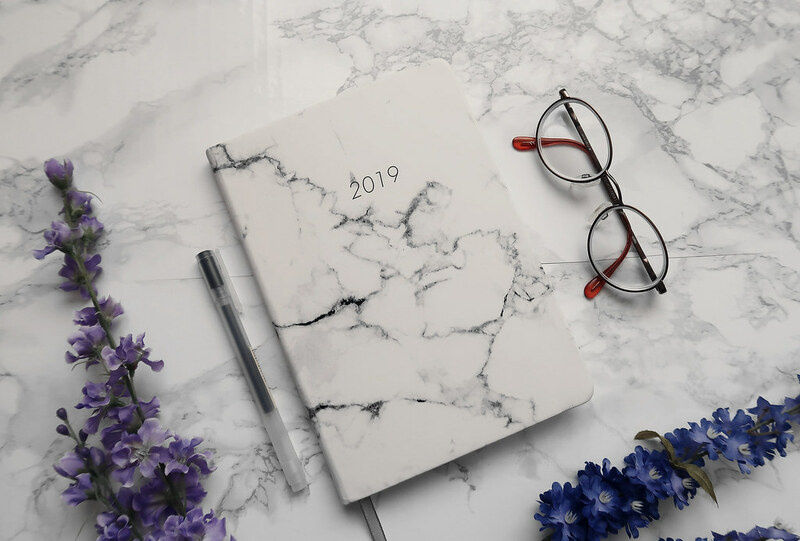 And last but definitely not least, is this beautiful marble planner from Typo! I’ve always loved using planners because it helps me stay focused and organized, and every year in December, I always look forward to getting a new one for the upcoming new year! This year, I found the perfect one at Typo since I’ve been obsessed with marble designs for the longest time. I love how the pages have a weekly layout, making it perfect for planning out my to-do lists! I know it’s weird, but I’ve been filling up the pages already with all of my goals for 2019! Are any of you fans of physical planners too? Or do you use apps to keep your to-do lists in check! And that wraps up my last round of favorites for 2018! I can’t wait to discover some new makeup and skincare goodies in 2019! What were some of your favorites this past year? And what’re you the most excited to try this year? Let me know in the comments because I always love hearing from you! They all look amazing! I’m also obsessed with my PMD! Yes, it’s the best! I’ve been using mine once a week! Ohh, planners without written years are perfect ❤ 🙂 I've been obsessed with the marble print for awhile now! Your agenda is so cute! I’m diving into the world of bullet journaling after trying it out half-way last year. I really wanna try out the PMD but I’m terrified of not getting the worth out of my money. Oh, I’ve been wanting to try bullet journaling for the longest time now ❤ I've seen so many amazing ones on YouTube! And the PMD is totally worth it! My skin always feels so amazing and soft after I use it! Honestly you have flawless skin sooo def taking your advice on all skincare recs 😉 happy new year babe!! Thanks for sharing with us your December favorites! I think the Amika and Milk makeup products would be great for traveling cause of how their packaging was designed. I actually have a PMD as well and it seriously does do wonders for skin maintenance! Uh some lovely ideas Elizabeth! I really like this planner, such a cool one! This planner has been my favorite! ❤ 🙂 Thanks Carmen!